To ask other readers questions about The Untethered Soul, please sign up. Mindfulness, strengths-based work, contemplation, and similar wellness-oriented activities, especially with overlap in psychology, are major areas of interest for me. I also tend to be drawn to prayer card decks. The Untethered Soul card deck from Michael A. Singer, based on his book of the same name, caught my attention as perhaps a more secular version of this interest. These 52 cards have short phrases to inspire and This review first appeared on my blog, Jacob's Café (jacobscafe.blogspot.com). 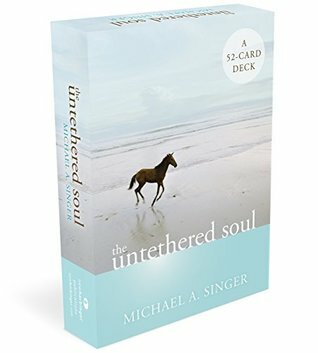 The Untethered Soul card deck from Michael A. Singer, based on his book of the same name, caught my attention as perhaps a more secular version of this interest. These 52 cards have short phrases to inspire and help center readers. First off, the box and cards are very well made and beautiful in their own right. It doesn't feel like a cheap paper or cardboard container or deck set. It's something that looks nice on a desk, which is exactly how I use this one. I put the lid on the base at a 90 degree angle, providing a background and display a different card each week. The image backgrounds have a good nature basis that can be used for contemplation and almost automatically provides some relaxation. The phrases, grouped into themes, can be encouragements, inspiration, or even questions encouraging reflection. One could easily just read through all the cards and move on with life, but that would miss the point. Sitting with them for contemplation and centering work is where they're useful. As I suspected, they do have a more secular feel in many cases. However, some cards draw from various religious traditions, albeit lightly. If someone wants encouragement from a single tradition, you'll probably want to pass on this set. However, if you're open to considering wisdom from around the world, the phrases and considerations can be a useful foundation for contemplation and meditation. The deck's trailer provides a bit more context. This video makes the deck seem quite new age-y/self-help-like, and it can have that feel (positively or negatively, depending on your perspective). However, I have to say I think the promises in the video are more than a bit over-stated. No card deck or phrase will be truly transformative on its own. If you view the deck as an opportunity to remind yourself to be present and reflect, then it can be useful. But the sayings aren't necessarily any more inspirational or transformative than other decks. In fact, the lack of a firm spiritual tradition or psychological rootedness may make the deck and phrases appear to have less depth or "thickness." In any case, this can be a nice gift for a loved one or even yourself. The benefit of it not being overtly spiritual is it can be used as a gift in many contexts. I love this deck. A lot better than playing poker. Anytime I get uptight, I just grab a card and the thoughts put me in a better place. The cards are calming, and just like the title, they free you from the nonsense. I have used a few for bookmarkers, and I actually handed one to a lady at a doctor office when the doctor was an hour behind. The card said, "Most of life will unfold in accordance with forces far outside your control, regardless of what your mind says about it." She smiled and said I love this deck. A lot better than playing poker. Anytime I get uptight, I just grab a card and the thoughts put me in a better place. The cards are calming, and just like the title, they free you from the nonsense. I have used a few for bookmarkers, and I actually handed one to a lady at a doctor office when the doctor was an hour behind. The card said, "Most of life will unfold in accordance with forces far outside your control, regardless of what your mind says about it." She smiled and said, "Yes, so true, but I am still leaving." I also have some ideas of making some cards for friends out of the deck. I am really glad to have this deck for my mind, my heart, and my "untethered soul". If you loved the book, you will enjoy these cards as a reminder of some highlights of the book. I have one set out each week and read it at least once a day during that time. Great as a gift for someone who is a fan of the book. I feel very lucky to have recieved such a treasure! Singer received a master's degree in economics from the University of Florida in 1971. During his doctoral work, he had a deep inner awakening and went into s Michael A. Singer is the author of the highly successful The Untethered Soul, which has also been published in Turkey, Brazil (in Portuguese), Switzerland (in German), Spain, Japan, China, the Netherlands, Denmark, Finland, Poland, and Italy.